While you are looking for simple ways to manage your in-room TVs, your guests are expecting a content-rich environment when the TVs are powered-on. 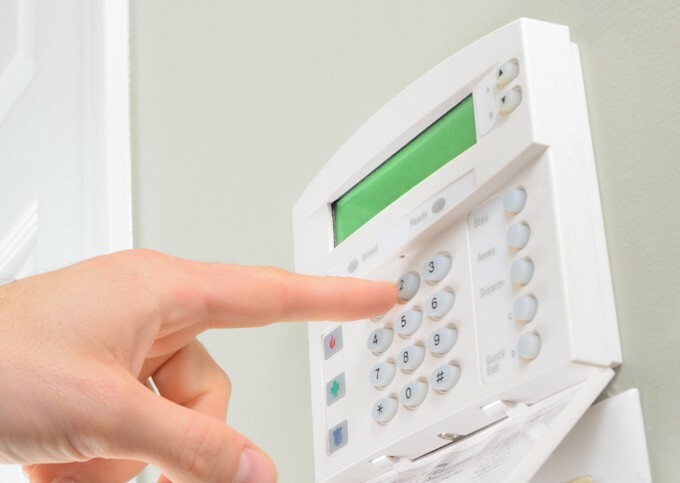 The CES SMART Solution combined with our Team’s expertise can really help you! 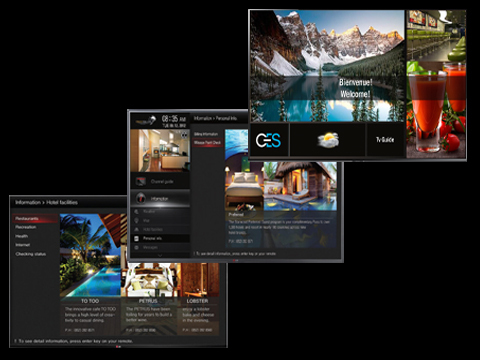 From picking the right TVs, remotely managing all aspects of the TV’s configuration and offering your guests the Rich Content Interactive Information they want, CES is your hospitality specialized decision partner. Call us for more information and a personalized proposal, including a compliancy evaluation of your existing TVs. With Samsung’s game-changing hospitality TVs, guest can now stream premium HDTV content stored on their smartphone, tablets and laptop straight to their TVs thanks to AllShare TM Cast technology. 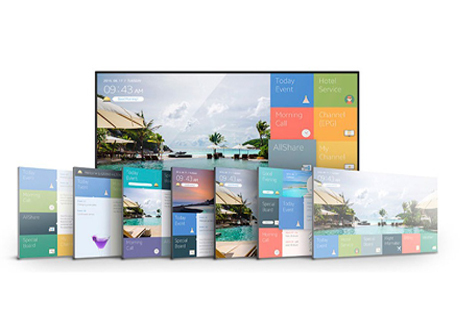 And with Samsung’s suite of Smart TVs, guest can access the same apps and widgets they’re accustomed to at home for a more personalized entertainment experience. Plus, all TVs are equipped with Samsung LYNK TM DRM Technology and are REACH 4.0 compatible, making them as easy to install, customize, manage and control for property managers. Our mission is to offer our customers the best selection of Samsung products capable of satisfying their unique industry technological requirements. 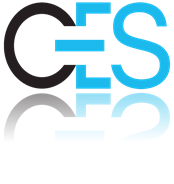 CES will centralise and manage your project to ensure your experience is maximized with a unique point of contact. CES Distribution has a team of highly qualified technicians to perform a complete installation of all equipment across Canada. In addition, we will assist you in the integration of your promotional contents ensuring therefore that your message is visible and continuously updated. Discover a new level of refinement with integrated hospitality signage that can add sophistication and style to high traffic areas such as entry ways, lobbies, and check in counters. 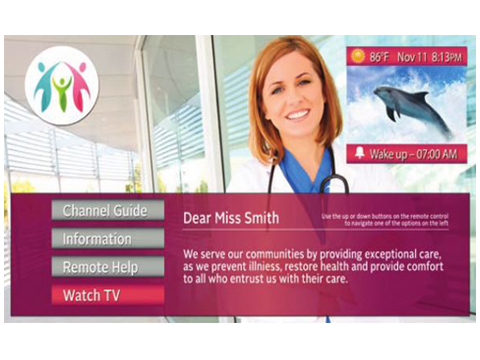 LG takes advantage of some of the most advanced and flexible digital products and technologies to develop digital signage solutions for properties looking to enhance the quality of the guest experience. 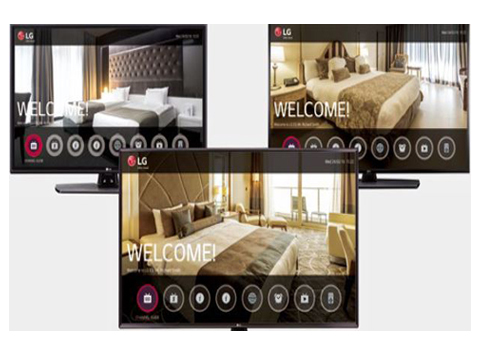 LG provides hospitality solutions for in-room entertainment and digital signage designed to enhance the guest experience. With LG hospitality TVs, you can provide y the latest in in-room entertainment, including access to on-demand movies, email, online content and more. 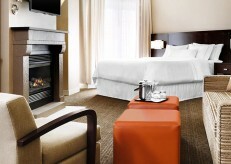 Pro:Centric® Interactive Guestroom Experience! 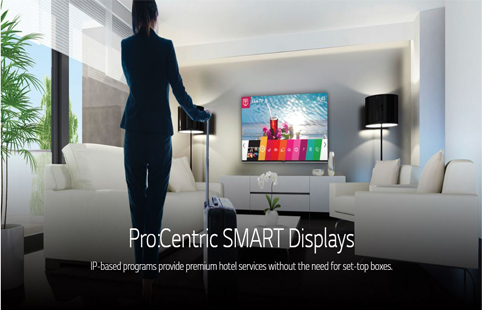 LG’s Pro:centric solution allows hoteliers to customize the in-room experience. 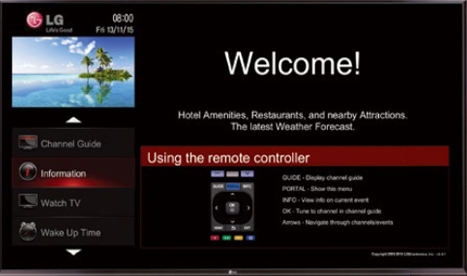 Pro:Centric provides an easy way to interface with inter-active program guides and internet data feeds, as well as applica-tions designed to connect guests to hotel services such as room service menus, and spa services.